These Dawn FC (framing camera) images show the central area of the south polar basin. The mountain/central complex is the roughly circular feature in the center of the image. There are grooves, scarps and hummocky (e.g. wavy/ undulating) terrane around and on this feature. 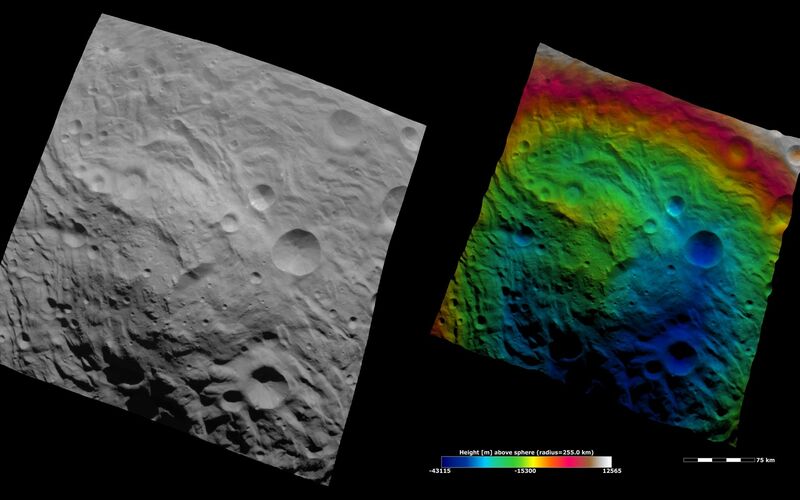 The left image is an albedo image, which is taken directly through the clear filter of the FC. Such an image shows the albedo (e.g. brightness/darkness) of the surface. 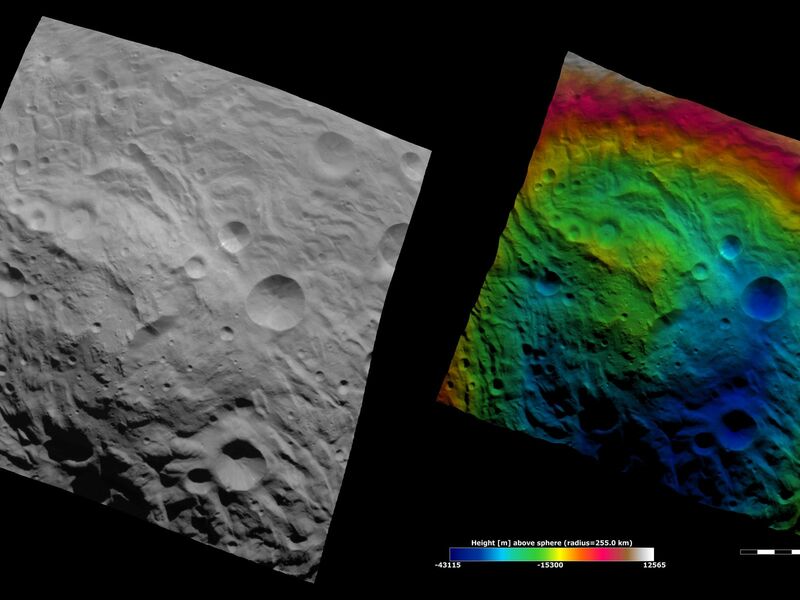 The right image uses the same albedo image as its base but then a color-coded height representation of the topography is overlain onto it. The various colors correspond to the height of the area that they color. For example, the white and red on the top edge of the right image is the highest area and the blue areas in the bottom of the image is the lowest. This color-coding shows the topography of the region well: the mountain/ central complex (colored green and yellow) is higher than the roughly circular depression surrounding it (colored blue and green), which is all lower than the red and white region in the top of the image. The topography is calculated from a set of images that were observed from different viewing directions, these are called stereo images. 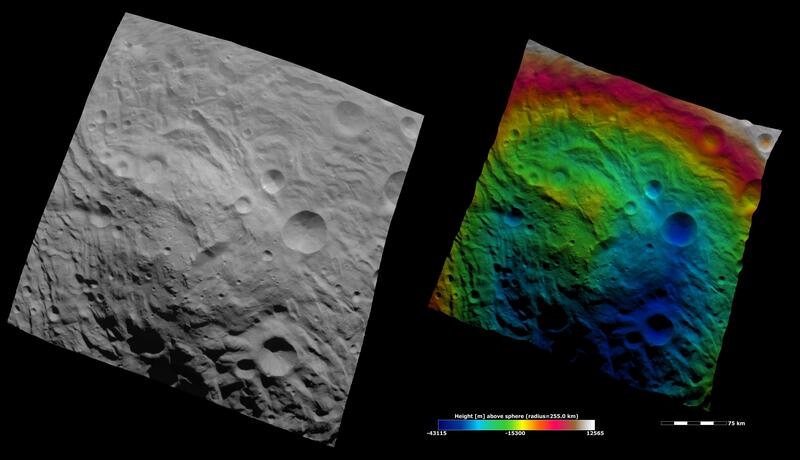 NASA's Dawn spacecraft obtained the albedo image with its framing camera on August 11th 2011. This image was taken through the camera's clear filter. The distance to the surface of Vesta is 2740 km the image has a resolution of about 250 meters per pixel. The images are projected using a lambert-azimuthal map projection. 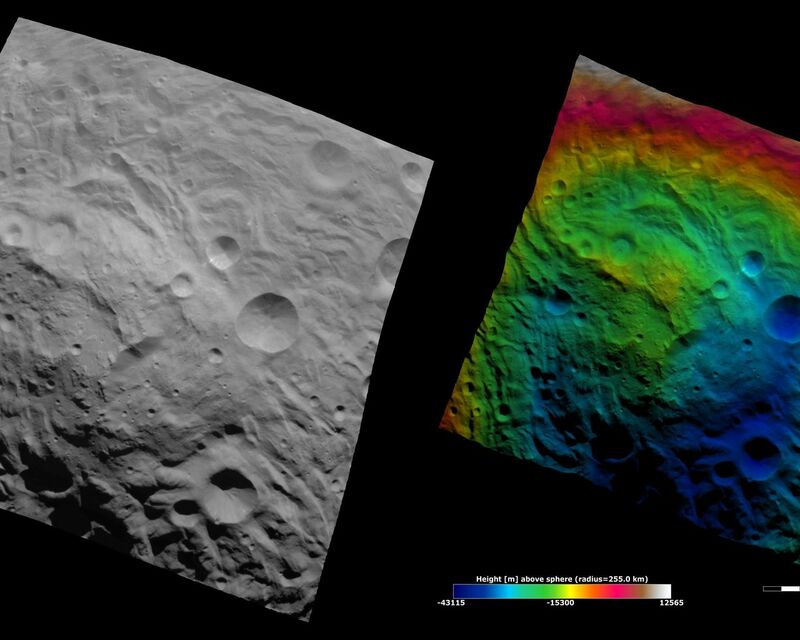 The Dawn mission to Vesta and Ceres is managed by NASA's Jet Propulsion Laboratory, a division of the California Institute of Technology in Pasadena, for NASA's Science Mission Directorate, Washington D.C.. UCLA is responsible for overall Dawn mission science. Dawn's VIR was provided by ASI, the Italian Space Agency and is managed by INAF, Italy's National Institute for Astrophysics, in collaboration with Selex Galileo, where it was built.